If you're shopping for a classroom or conference room projector that can handle a room up to 40 to 60 feet (12 to 18 m) deep, we may have a candidate for you. A room this size needs a screen with a 10 to 12 foot diagonal (2.7 to 3 m) for data or presentation applications. You also need a projector in the range of 2000 to 2500 ANSI lumens. If you did a search for projectors that fit this requirement, you'd come up with an ample selection of 122 projectors as of this writing. For educators and business people trying to stretch their dollars during these uncertain times, we decided to restrict our search to projectors with an (MSRP) of $2,000 or less and found 39 projectors that fit the profile. Since we were also interested in a conference room projector with high contrast so we could enjoy some quality video, we tightened our search by using a minimum contrast ratio of 2000:1. We were now down to 22 projectors - a manageable list. Not surprisingly, all these projectors use Texas Instruments DLPTM technology due to our high contrast requirement. Recognizing that some people are sensitive to the "rainbow effect" of DLPTM, those brief moments of color separation that a small percentage of people see when the eye transitions rapidly between light and dark areas of the image, we looked for projectors with a color wheel speed greater than the typical classroom and conference offering of 2x and we found one - the Sharp XR-20X. considerably more economical than their 3-chip counterparts, but they also require a spinning color wheel to generate color. A 2x color wheel spins at 120 revolutions per second (2 x 60 Hertz = 120 Hertz) and refreshes each color once per revolution. One way to minimize the "rainbow effect" is to increase the spin rate of the color wheel. This is exactly what Sharp did with the XR-20X projector. It's color wheel spins at 180 Hertz or 3x. 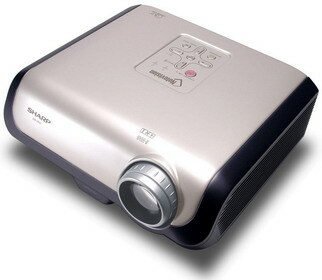 The result is a projector with a reduced "rainbow effect" and improved image quality that is especially noticeable in video flesh tones due to its higher color refresh rate. If you're a home theater enthusiast, the XR-20X is not a substitute for any of the dedicated home theater products that we have recently covered. It is, however, measurably better than 2x business projectors we have seen. With a street price of $1350, the XR-20X is an economical XGA (1024 x 768) projector that is targeted for the classroom and conference room. With a 10 foot wide screen, contrast ratio of 2000:1, and 2300 ANSI lumens at full brightness and 2000 ANSI lumens in economy mode, it is suitable for rooms with seating up to 60 feet (15 m) from the screen for PowerPoint type presentations, 45 feet for data viewing, and ideally 22 feet for video; however, any of the distances will work for video. The unit weighs in at 8.6 pounds (3.9 kg) and at full lamp brightness generates 33 dB of fan noise. In economy mode, fan noise drops to 30 dB. These noise levels are comparable to other conference/classroom projectors of this brightness. With auto keystone correction and a simple setup guide at power up, the XR-20X makes it easy to get going quickly. Focus and zoom are manually adjusted on the barrel of the lens. The 1.15:1 zoom lens allows a 15% adjustment in image size. A quick release foot on the front of the unit sets the angle to the screen with a rear foot to either side to square the angle to the screen. although the XR-20X scaling is very good, the greater the keystone correction the more evident are the scaling artifacts. The projector lamp life is rated with a half-life of 2000 hours and can be extended to 3000 hours if operated in economy mode (2000 ANSI lumens). Replacement lamps are $349 MSRP. For meeting management the XR-20X remote control provides an AV Mute that allows you to disable audio and video to re-establish contact with your audience. A break timer of up to 60 minutes is also provided, so it is always clear when the meeting will resume. While color temperature is key to getting an image to look "right", be aware that color temperature has a dramatic impact on light output. Moving from a high color temperature to a low color temperature can cut light output in half. Recognizing that room light is the enemy of projectors and that low color temperatures are affected more than high color temperatures, Sharp added a feature they call Bright Boost to enhance light output by pulsing the lamp during the white (W) segment of the 4-segment (RGBW) color wheel giving the image a boost of up to 40% more light. This feature gives you a way to combat excessive room light, but at the expense of color saturation. The XR-20X can handle 480i, 480p, 540p, 576i, 576p, 720p, 1035i, and 1080i video sources and supports a wide range of computer resolutions from 640 x 350 to 1400 x 1050. Resolutions that exceed the native resolution of the display can either be scaled to fit the display or shown in native resolution. Pan and scan is provided for native resolutions that exceed the resolution of the XR-20X. As mentioned earlier, scaled images are very good, but there is no avoiding the reduced readability that occurs when scaling a high resolution image to a lower resolution, especially when viewing small text. The XR-20X uses a shared audio input (minijack) to support up to 2 RGB sources that also handle component video. A monitor connection allows attachment of a monitor for local viewing of the projected image. An S-Video and Video connector is provided with a shared audio input (RCA type connectors). An RS-232C connector is provided, if you wish to control the projector from a computer.